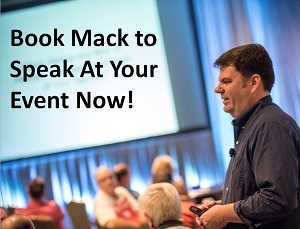 Note from Mack: This is a Sponsored Post from Marketing Profs that ties in with their #Blogchat Sponsorship from May. If you would like to learn more about the Marketing Writing Bootcamp, click here and if you register with code FANDAMN you can save $200! Also, Kerry O’Shea Gorgone and I talked about the Marketing Writing Bootcamp on the latest episode of The Fan-Damn-Tastic Marketing Show. As a marketer, writing comes with the territory. And, it’s imperative you stay at the top of your game, not just in one skill or discipline, but in all of them. That’s why we created Marketing Writing Bootcamp: 13 classes tailor-made for anyone tasked with a variety of writing duties. Marketing Writing Bootcamp will provide you dozens of tips and techniques for enhancing your writing style and teach you to write with a relentless focus on your customer. From presentations, sales proposals, and press releases to websites, blogging, and case studies—this course will cover it all—making you a better writer, and a better marketer. These online classes, delivered in easy-to-digest 30-40 minute increments, are specifically designed for busy marketers like you. 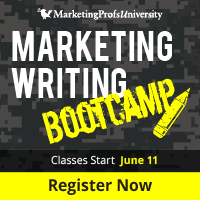 When you enroll in Marketing Writing Bootcamp, you’ll learn from over a dozen of the best and brightest instructors in the world of marketing writing. And, as a special offer to Fan-Damn-Tastic Marketing Show listeners, visit http://mprofs.com/fandamn and use promo code FANDAMN when you enroll to save $200 on Marketing Writing Bootcamp. Plus, you’ll get over $1,000 worth of Marketing Profs seminars, classes, and video tutorials, free – just for registering! So, whether you’re in direct response, corporate communications, product marketing, freelance services, or just get pulled into writing occasionally, I’m confident that Marketing Writing Bootcamp will provide the training you need. Plus, we have a 7-day money-back guarantee, so if you aren’t satisfied with what you’ve learned, we’ll refund your enrollment fee. No questions asked. Great job with this topic! I enjoyed it and am going to find out if my company is using these techniques and if not, I may just end up looking like a hero!